LAS VEGAS, Oct. 10, 2018 /PRNewswire/ -- Konami Gaming, Inc. announced exceptionally strong industry reception for the world debut of its new KX 43 video slot cabinet this week at the 2018 Global Gaming Expo (G2E) Las Vegas. Featuring a 4K Ultra HD display, slim profile, and exclusive library of leading game content, Konami's latest slot cabinet made a memorable impression at the opening of one of the industry's largest events. From KX 43™ to the Concerto™ Collection, Konami showcased an expansive game library focused on industry-leading math and mechanics. Game play innovations including Strike Zone™ and Reels Up™ deliver new bonusing features that uniquely allow players to experience added value and entertainment for their bet. Konami also premiered its award-winning SynkConnect "cardless" player loyalty solution. Designed exclusively for Konami's SYNKROS® casino management system, SynkConnect™ allows casino patrons to login to their player loyalty account at any equipped gaming machine using alternative authentication methods such as a fob, room key, or mobile device, as well as a traditional player loyalty card. "The reaction to KX 43 from global operators has been one of approval and anticipation. It has the right combination of premium and practical for today's core player base, with an incredible content library to attract and engage over time," said Steve Walther, senior director, marketing & product management. "Its creativity and quality provides a uniquely 'Konami' experience, which we look forward to delivering to the casino floor." Among the top titles featured on KX 43 is a symbol-driven linked progressive series with an original new Reels Up mechanic. 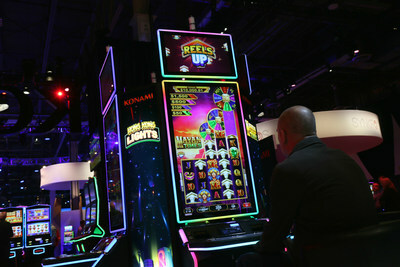 Debut titles including Vegas Rise™, Expanding Egypt™, Hong Kong Lights™, and Mayan Times™ display Reels Up arrow symbols acros all reels throughout game play. When players collect at least one of these symbols on reels 1 and 2, remaining consecutive reels with the symbol will expand upward for the chance to spin bonus reels with increasing instant guaranteed prizes at higher bet amounts. KX 43 also premiered a multi-denomination linked progressive called Ba Fang Jin Bao™, in which players can increase their extra bet in order to change increasing symbol sets to gold, with premium line pays over 8-times. "KX 43's exclusive game library is focused on delivering greater value to players in ways that are clearly visible and tangibly experienced with each spin. The same is true for our latest original game releases across the Concerto Collection. From the Triple Sparkle series on Concerto Opus to Thunder Arrow on standard Concerto upright, these games demonstrate a distinct value proposition for players that is both rewarding and entertaining," said Walther. Currently available across domestic markets, Konami's big screen Opus™ cabinet features a 4K Ultra HD display and new linked progressive derivatives on popular classics including Solstice Celebration™, Riches with Daikoku™, and Dragon's Law™. Additionally, Opus premiered a linked progressive called Treasure Ball that features an animated prize ball machine and $10,000+ Supreme. Konami's G2E 2018 display is also characterized by a record variety of integrated symbol-driven jackpot titles for dual screen Concerto upright and Slant. Series such as Thunder Arrow™, Money Galaxy™, Golden Blocks™, and Wish Dragons™ feature original symbol-based jackpot features with higher odds at higher bet levels. Konami's award-winning SYNKROS casino management system continues the focus on adding value to the guest experience through advancements in player convenience, in-game marketing, branded loyalty program touchpoints, and more. The debut of Konami's SynkConnect "cardless" player tracking solution has attracted particular attention. This touchless, multi-channel solution empowers casino players with a variety of secure methods to augment or replace a traditional player loyalty card at the EGM. For mobile cardless connection, players simply tap a personal smartphone device at the zone of the card reader bezel and the card reader changes color to indicate blue for inactive/uncarded connection, green for successful active connection, or red for misread/failed connection. Konami has also developed a player mobile app called SynkConnect Mobile, which allows players to login to a device, manage their account, view points, redeem rewards, transfer funds, and more, directly from their smartphone.